A massive, challenging retro-flavoured shooter that takes the Metroid formula and runs with it. Old school, but with a modern edge. What is it? Sci-fi shooter inspired by classic Nintendo games. Developed by one man over five years, Axiom Verge is a remarkable feat. Not only because creator Tom Happ did all the art, music, programming, and design himself, but because it’s damn good too. It’s inspired heavily by the Metroid series, but it doesn’t feel like a rip-off. The DNA of Nintendo’s game is felt in every pixelated corridor—the compelling exploration, the backtracking, the eerie otherworldly atmosphere, the tough bosses—but it has plenty of ideas of its own. You play as Trace, a goofy-looking scientist who, after an experiment goes explosively awry, wakes up in a strange alien world that looks like something out of H.R. Giger’s nightmares. It’s a strange bio-mechanical place filled with weird monsters that Trace must battle through to escape. Honestly, I didn’t find the story that engaging. It wasn’t the narrative that kept me pushing on, but finding out what new boss, enemy, power-up, or weapon was waiting for me around the next corner. Really, the story is just an excuse to explore, and it’s exploration that defines Axiom Verge. The game is comprised of several huge maps, which can be explored freely. You’re nudged subtly between bosses and areas, but it never feels like you’re being guided. It’s through ample use of gear-gating that the game stops you from venturing too far. In true Metroid style, you’ll frequently come across obstacles that are seemingly impossible to get past, only to find a gadget later that unlocks the way. These include a drill to break through blocks, a coat that lets you teleport through solid objects, and—my favourite—a thing that ‘de-glitches’ parts of the level that have gone all garbled and weird, like a NES cartridge that someone forgot to blow in. That feeling of returning to a section of level you were totally stumped by later with the right tool, and it suddenly making sense, is a constant delight throughout. Weapons also help you bypass obstacles. One fires balls of energy that can be remote-detonated, letting you unlock a certain type of door. Others, though, are just for killing, and they’re all really creative and fun to use. Your ever-expanding arsenal includes a laser-shotgun, a thing that shoots arcs of electricity, heat-seeking orbs, and what I can only describe as a space-boomerang. They all have proper names, but I can’t remember any of them. You’re never short of interesting ways to shoot things. The strange, sinister world Trace finds himself in is a vast, interconnected maze. As you explore, a map is filled in that you can pull up at any time to get your bearings. Important rooms like boss and save chambers are marked with a distinct colour, but mostly you’ll have to rely on your memory to keep track of where stuff is. I became obsessed with filling in every cube on the map, and my exploration was rewarded with health-boosting power-ups and documents that fill in the backstory. Again, the story isn’t really that vital to the experience, but it’s there if you’re interested. It’s one of the purest expressions of the ‘Metroidvania’ genre on PC. Trace’s movement is snappy and responsive, but I found shooting diagonally a bit clumsy. You can’t stand in place while firing, so it’s impossible to shoot at an angle without moving forward at the same time. It’s a tiny thing, and I got used to it for the most part, but it was always niggling at me. Otherwise, this is an impressively solid, polished game that feels like it was built and play-tested by an entire team, not just one guy. 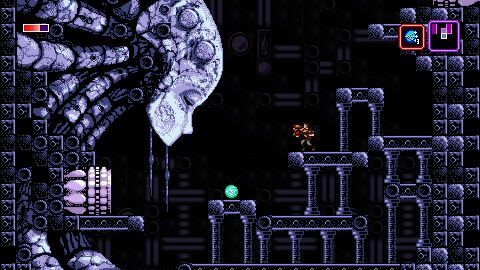 Axiom Verge joins the superb Shovel Knight as a game that doesn’t just borrow the aesthetic of retro games, but understands why they worked so well as games too. It’s one of the purest expressions of the ‘Metroidvania’ genre on PC, focusing on tight design, minimal story, and addictive, rewarding exploration. Be warned, though: another way it pays homage to the past is with its stiff difficulty. You’ll need the reliable precision of a good D-pad to get past some of its huge, bullet-spewing bosses.